One of our clients contacted us with a view to designing and producing an external, low voltage light bulb holder primarily for festoon lighting. We were puzzled to say the least, it’s been done before we said, why did they need such a special holder for such a simple job? Our clients explained that they had a worldwide patented method of automatically switching lights on and off as well as fade on and off, and they used a bespoke chip and PCB to activate each light bulb individually in a pre-programmed sequence. They could not find anything in the market that would be suitable to house the electronics, cable and lamp, so they instructed our design team to design one for them. What is unique and innovative about this product, is that the main housing is split along it’s length, usually lamp holders are moulded cylindrically using a number of components. Being moulded in two halves allows for the insertion of the electronics and the self-piercing pins. These pins pick up the electrical supply from the festoon cable, pass through the PCB to the bayonet pins and finally lighting the lamp. The two halves are held together by an assembly 'nut' and with the help of a moulded TPR gasket, the electronics area of the unit is rendered IP67 water tight. The lamp holder is designed to take standard low voltage BC lamps rated at 48Vac 5W. Up to 200 lamps can be fitted to a 100 metre string of cable, additionally, up to 500 strings can be linked via a serial cable between the PSUs. 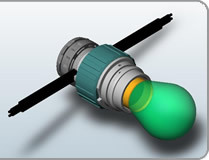 Each lamp can be programmed individually via a hand held programmer, or because each lamp has a unique number, they can be programmed on a PC and downloaded to the array via RS232 to create an impressive lighting display. So when you see masses of festooned illuminations, all twinkling and flashing, marvel not only at the lighting display but consider the hard work and innovation that has gone into the humble light bulb holders.